Like most of you, my crock pot gets a lot of use during the winter months. Soups and stews are so easy when you just toss everything into the slow cooker and walk away! Crock pots are still handy in the summer-time, too! When I'm busy outside with Grace on a hot day, the last thing I want to do is cook dinner. And take out isn't always an option. So, if I throw something together into the slow cooker before going outside to play, dinner is pretty much ready by the time we come back inside. 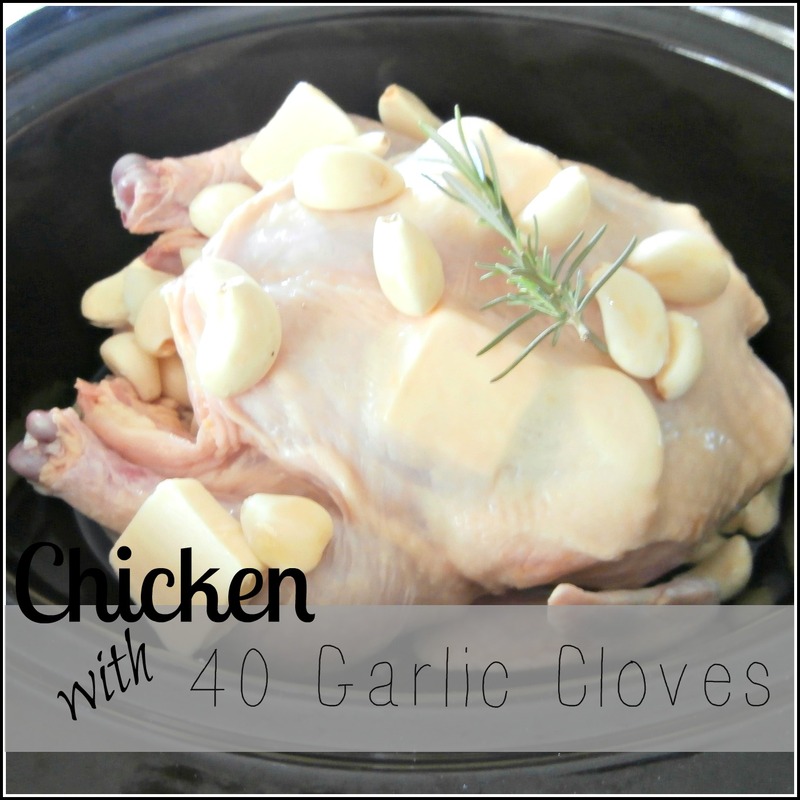 A few weeks ago, a friend mentioned that she was making Crock Pot Chicken with 40 Garlic Cloves for dinner one night. This reminded me of the fact that I had this meal mentally added to our summer menu plan. I had a whole chicken in the freezer and a big jar of garlic cloves in the fridge. It just took me several days to get around to thawing out that darn chicken! Honestly, things that go into our chest freezer almost never make it back out! Well, they do...it just takes longer than planned. I need to work on getting that freezer organized so that I don't dread having to dig something out of there for dinner! But that is for another post....let's get back to this chicken dish! This recipe is just too easy! Three ingredients are all you really need for Chicken with 40 Cloves of Garlic...but if you happen to have a few more seconds to spare, go ahead and take the time to add the onion, lemon, rosemary and ground black pepper! You won't be sorry! I snapped this photo before adding the fresh ground black pepper. The bird looks a little naked, but honestly crock pot chicken doesn't look much better after it's cooked....but oh, it tastes sooo good! Squeeze lemon juice over the chicken then place the lemon and onion inside the cavity of the chicken. Wedge a few pieces of garlic under the skin, then toss the rest over top and around the chicken. Do the same with the butter. Top with a sprig of rosemary and some black pepper. Cover the crock pot with the lid and cook for 6-8 hours on low. I usually add the onion to my garlic chicken, but this time, I really enjoyed the addition of the lemon and rosemary! The flavors are so perfect for a summer meal!